While many of the works at NADA Miami Beach 2013 presented trends of abstraction in painting and digital manipulation, some pieces that stood out seemed to ambulate instead toward an association with the arcane and mystical. Below are some highlights from this archetypal subplot. 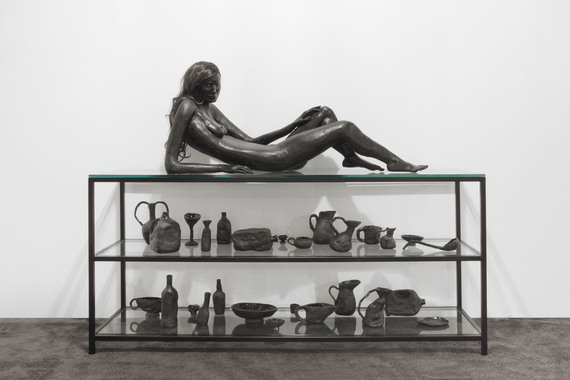 Elizabeth Jaeger, "Serving Vessels," 2013 Ceramic, hydrocal, steel, glass and wig, 88 x 20 x 60 inches. Courtesy of the artist and Eli Ping Gallery. Posing as muse and mannequin, Elizabeth Jaeger's impressive ceramic sculptures with synthetic hair and latex paint are set on display in stretched out bodily positions. Jack Hanley Gallery included the piece Mudita and Eli Ping Gallery presented a darkened life-sized sculpture, Serving Vessels. Both figurative sculptures bring to mind the anima, one of Carl Jung's archetypes, along his description of nixies: "Nixies are entrancing creatures: Half drew she him, / Half sank he down / And nevermore was seen... She can also be a siren, melusina (mermaid), wood-nymph... a lamia or succubus... these beings were as much dreaded as adored." The word nixie can also mean undeliverable mail due to a faulty or illegible address, representing a failed or insufficient gesture of communication. Straddling both terms of operation, Jaeger's sculptures have the effect of embodying the awkwardness of objectified intention and personified seduction. 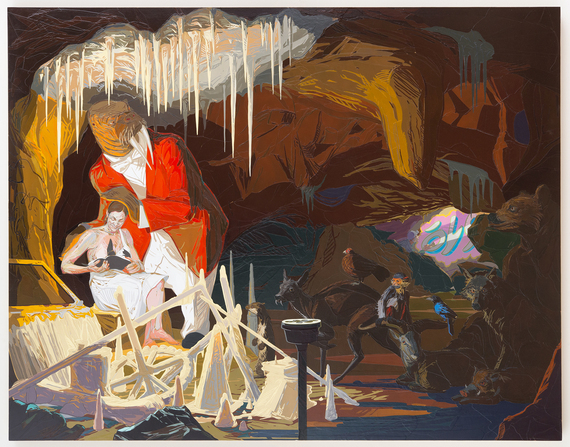 Timothy Bergstrom," In Ecstasy (Glound)," 2013, Plastics, wire and glitter on canvas, 60x48. Courtesy of the artist and Roberto Paradise. 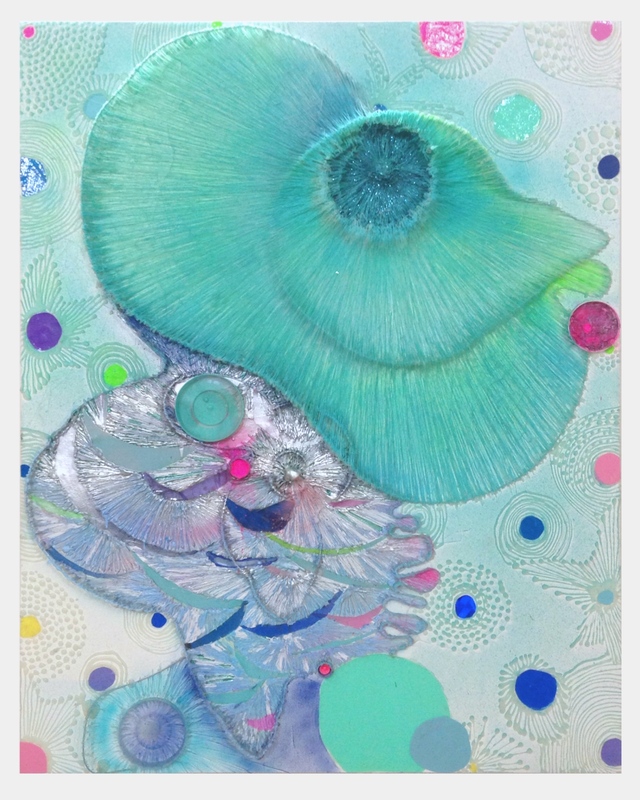 Timothy Bergstrom's works are assembled with an extraordinary technique of applying plastics, wire and acrylic on canvas, and he focuses on surface and dissonance. The finished paintings resemble semi-uniform fissures of geothermal vents and the prismatic borders of hot springs. Beyond the geological, they also appear fungal, like the radiating gills of a mushroom's underside. Bergstrom's works at Roberto Paradise included mythologem points rendered out of glitter, and his sharp palettes are sometimes inspired by filmic color effects pulled from screenshots. Mihuţ Boşcu Kafchin, "Reptilians Don't Drink Chlorinated Water," 2013, installation (ceramic, painting, bricolage), variable dimensions. Courtesy of the artist and Sabot. 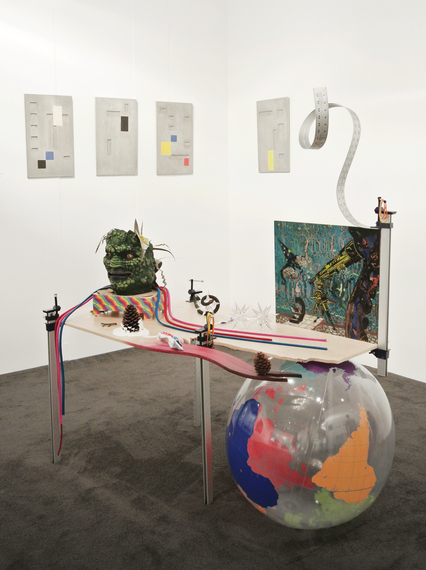 A table of polarized sculptural pieces includes a monstrous reptilian mask, a rubber snake coiling around a spiny crystal and toothpaste drizzled over a pine cone. These objects present a correspondence between the fantastic and everyday that forsakes decoding. A painting also rests on the table, depicting a wizard hat hovering over cartoonish brains that are tethered to a telescope and a microscope. The painting alludes to the apparatus of seeing, postulating perception as a mystical process of interpretation. Its background is a tangled forest of synaptic passages, where unseen signals and transmissions allow for neural processes. Brian Adam Douglas, "The Hind Milk," 2012. Cut paper on birch panel with UVA varnish, 38 x 48 inches. Courtesy of the artist and Andrew Edlin Gallery. Obsessively collaged cuts of paper appear flawless and whole, with no hint whatsoever of their mosaic form. With storied precision, an open narrative takes charge: a sophisticated walrus in a red blazer dotes over a woman amidst a congregation of exotic birds and mammals representing far-flung geographical habitats (arctic, jungle, etc.) and therefore journey. Set in a cave beneath a slow leak of stalactites, a kangaroo, bear, meerkat, boar, wolf and monkey appear out of place yet harmonious: there is neither explanation nor sound of alarm. The piece resembles a Victorian fairy tale, with peril cloaked as a wild beast resting in torpor.